Here’s what clients are saying about our work! 21 Tips for Getting Your Home Ready to Sell! Are you or someone you know getting ready to sell their home? Make sure they and their house are prepared before it hits the MLS. A few minor touch-ups can go a long way toward making a great impression on potential buyers, and might even help you cinch a deal more quickly. Pretend you’re a buyer looking, and walk through the house like it’s the first time. Make notes on what you as a buyer would notice, and then repair or replace those items. Some ideas for preparing your home for the market include getting rid of clutter, hiding family photos, cleaning out closets, removing excess or oversized furniture, and cleaning. Lots, and LOTS of cleaning. We all have one. The dreaded honey-do list. Whether it’s re-caulking around the tub and toilet, cleaning any scuffs from moving furniture, or switching out that broken light fixture, these are things that need to be done. They may not stand out alone, but when everything is all said and done, these little fixes will be your ticket to the closing table. Clean like your in-laws are coming. Dust the blinds, fan blades, and the hard-to-reach places you normally skim over, polish your shiny surfaces like faucets or doorknobs (stainless steel appliances, too! ), and give the windows a thorough washing. 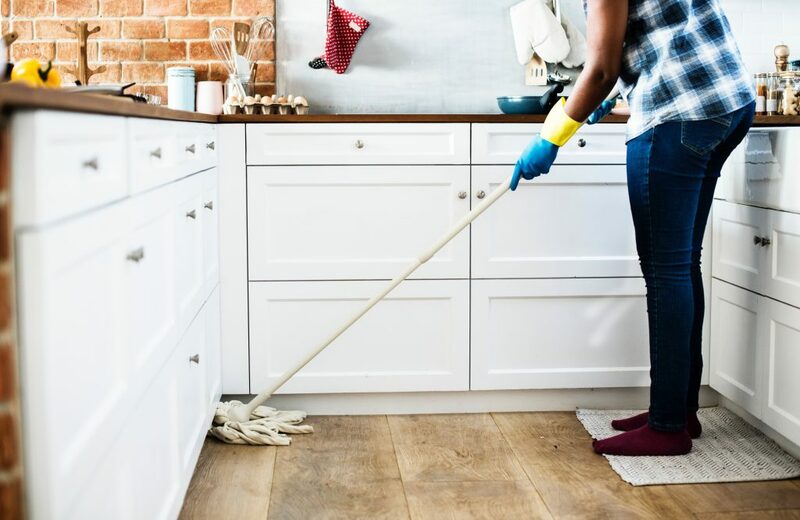 If you’ve already moved out or if you’re too busy to stay on top of things, you may consider hiring a cleaning service to stop by every couple of weeks for some extra help. Open up all blinds and curtains to let in natural light. Consider adding lamps to areas that are dim, and remember that white walls help to keep things bright as well! A bright and cheery room not only looks bigger, but more inviting, too! If a room is messy and unkempt, chances are that’s what the buyers are focused on instead of how they would arrange their furniture in this space. You’ll want to find “homes” for anything that isn’t intentionally placed out, like that stack of mail from the kitchen table, or the stack of video games on the entertainment stand. If you need ideas on what to put away and what to “stage”, I recommend visiting a couple nearby model homes and taking notes on what accessories are left out and how it adds to the space. Builders have professional staging companies come in that show the best way to make a home feel larger and uncluttered, which helps a potential buyer to imagine themselves living there. You can also look here for storage tricks and ideas. Repaint the walls neutral colors. Your daughter may love her super-hip purple bedroom, but not all buyers have the same taste as your family does. The idea is to make it as easy for the buyer to picture themselves in your house as you can, so repainting your rooms in neutral tones like greys and whites allow them to focus on the space itself, and not be distracted by the color of the walls. Keeping with the idea of the paint colors, you’ll also want to pitch or hide any art or other decor that might turn off people with different tastes. Remember that you want to be very specific about where your buyer’s eyes will be drawn to, and you want to get their attention in a positive way without distracting. Try staying classic with landscape paintings or simple artwork rather than showcasing your leopard print velvet couch in order to let the buyer’s mind wander into daydreaming about what their furniture would look like in there. You want it to be so easy to imagine, that it would be stupid to pass this home up! Personal memorabilia has to go. Rolling over from keeping it simple, you also want to get rid of anything specific to your family, because the buyer will be too busy thinking about what you do for a living or how old your kids are now rather than picturing themselves there. You want to separate yourself from the home so someone else can put their foot in, so remove family photos and take down your kids’ prized drawings from the fridge. You also might consider clearing out your Broncos-themed game room because as much as we like to think this, not everyone is a Broncos fan, and that may actually hinder your chances with a buyer. Crazy, huh? Give each room an identity. You know that guest room you have that’s also serving as an office, storage room, and tanning salon? (Ok, maybe not the last one, but you get the point.) You need to pick one of the identities you’ve given it and roll with it. Guest room? Great. Office? Even better. No matter what you’re calling it, you need to make sure potential buyers can label it the same thing you do. Keep in mind when you’re cooking that someone may be stopping by on a showing at any time. This means that any strong spices or oils can leave behind a scent that may deter some buyers. You’re also going to want to make sure you’re taking the trash out frequently, and keeping pets shampooed and cat boxes clean are great ideas as well. Potted plants and a gorgeous bouquet in a vase can work wonders with bringing energy into a space. You can also use them to fill in empty corners, or even draw attention to features you want buyers to notice. Do you have a really pretty built-in that was your favorite feature when you moved in? A great orchid could be just the thing you need to draw their attention there. Here’s my Pinterest board for ideas of what plants to use according to your wants and needs in the home. Downsize on the couches and beds. Your furniture should fit the space of the room, so get rid of any extra or oversized items that could make your space look smaller than it actually is. Buyers want to see LOTS of storage space in your home, so make sure you’re not giving the illusion that you don’t have enough of it. Invest in some boxes, dividers, and other solutions that will help make your things look more organized, and remove extra items you don’t need immediately (you can stow them away until you move). It’s amazing how something so little can do so much. Try doing little things in your particularly beaten-up rooms to make them sparkle. Try a new fixture in the dining room or new handles on your cabinets. It might even be as simple as a new comforter on your bed if your old one isn’t looking great. Chicks dig spas — for real. Sell buyers on your bathroom by spending $30 (or less!) to make it seem like a luxurious vacation they’re escaping to every time they brush their teeth. Buy fluffy new towels (preferably white, light green, or blue), candles, a plant or two, and pretty little soaps to cozy into your spa, and get ready to set the ahhhhmbiance. Another (free!) way to spruce up your living space is to turn sitting areas into conversation central. Arrange your couches and chairs to inspire a gathering area to help your buyers imagine entertaining and all the places they could host people. Get flow, get flow, get flow. To the windooooows, to the walls!… Sorry, impromptu dance party over here after thinking of this category title. Anyway, while you’re doing your walk through with your “buyer’s hat”, pay attention to anything that interrupts the flow of your tour. You want to make sure people aren’t hitting any furniture when they tour your home because it makes your space feel cramped and may put a negative impact on the buyers’ thoughts of the layout. Bring out the baker in you. What person doesn’t love the smell of fresh-baked… anything? Whether it’s bread, cookies, or pretty cakes and pies for the experts out there, smells like this can make a person connect with a kitchen. On top of having delicious and welcoming snacks for your showings or open houses, you’ll be standing out to the buyers because you’re adding one more “sense memory” to their repertoire. If you’re not great in the kitchen, you can always fake it with a Scentsy or scented candle, too! Find a few of your favorite places in your home, and try to show them why it’s your favorite. If you have a reading nook you love, try adding a big cozy blanket draped over the chair along with a classic book and a cute coffee mug on the side table to give people the feeling of coziness and imagining curling up there. Maybe you have a great craft room or workbench that’s your pride and joy. Organize it and flaunt it! Buyers aren’t always the most creative in thinking about how they can use a space, so the more you can guide them, the better! Decide where the buyer should look. Say you have an amazing fireplace or a really cool built-in. Help draw the buyers’ eyes to those with plants or cool knick-knacks that you have. Judge the book by its cover. This is probably the most important suggestion because a little time and money can go a long way. Make sure the lawn is mowed and the weeds are pulled in the summer, and the driveway and sidewalk is shoveled in the winter. Buyers sometimes will choose not to even enter a property if it doesn’t look nice when they first pull up. Something fun that’s a big trend right now is to paint your front door a bright color. If that’s not your gig (or even if it is!) you can always add a seasonal wreath to the door, too. Lining the walkway with potted plants is inviting, and you want to make sure that your exterior paint is in good condition as well. In many cases, the exterior shot of your house is the first photo the buyer will see while looking online, and you want to make a great first impression! Now, this is a big list with lots of things you can do, but if you can power through them, you’re giving yourself the best chance to sell your home quickly and maximize your net proceeds. If you need a fresh pair of eyeballs on your property, give us a call, as this is what we do! We would be happy to set an appointment with you! Contact us.